The Virtual Typewriter Museum: Universal "Simplex"
Little is known about this odd little machine, except that it is different from a couple of very flimsy look-alikes that were made in the US, either as toys, or as cheap home typewriters, like the Yankee, aka the Dollar Typewriter. The machine shown, identified as the Universal "Simplex", was originally patented in the US in 1884 als the Herrington Simplex, a design by G.H. Herrington and D.G. Millison. The patent line on this particular machine indicates that the machine is patented and made in Britain. 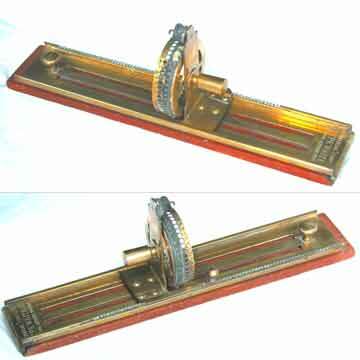 And if you look at the materials used (the machine is made of solid brass and wood) it is clear that it was not made as a cheap toy. But it is extremely clumsy. The operator had to turn the typewheel until the selected character showed up at the top, then push down the entire typewheel, then pull the mechanism one click forward and start all over again.